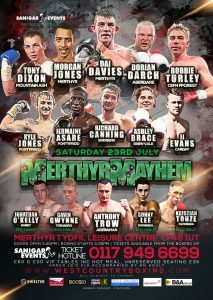 Sanigar Events will return to Merthyr Leisure Centre on Saturday 23 July 2016 for the second time this year with an action packed night of Championship boxing. Merthyr hero Dai Davies continues to build towards a shot at a major title as he looks for another win in front of his passionate fans. Last time out Dai produced a punch perfect performance over game Georgian Giorgi Gachechiladze and showed that he is still a threat to any UK featherweight. Unbeaten rising star Morgan Jones returns to his hometown after an impressive stoppage win in Cardiff on the undercard of IBF World Champion Lee Haskins. With 7 wins out of 7 Jones will certainly have his eye on domestic titles if he gets past his July 23rd opponent. Tony Dixon returns to the ring following a shocking knockout loss in May. A move up to light-middleweight should suit the man from Mountain Ash as he looks to get back to winning ways. 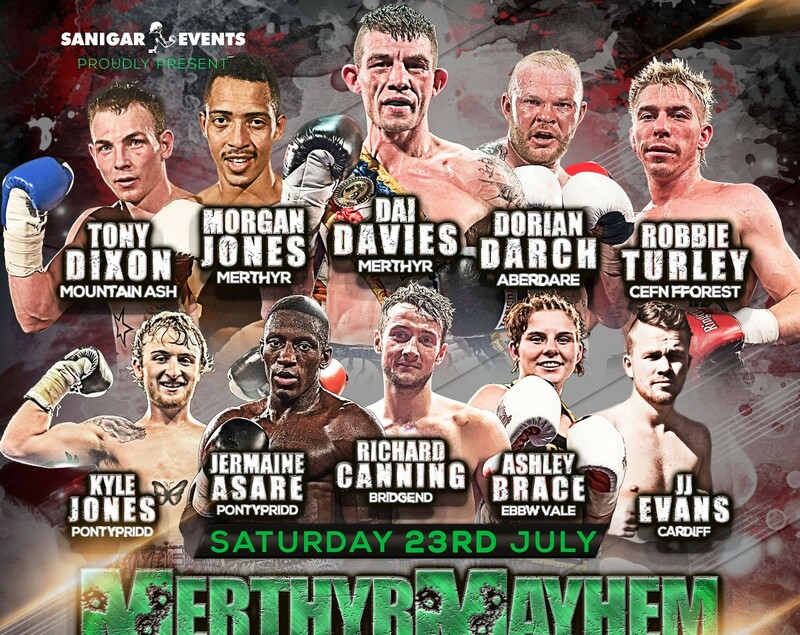 Heavyweight Dorian Darch hopes to extend his 3 fight winning streak and seasoned campaigner Robbie Turley returns to Merthyr for the first time since his 2014 Welsh Title clash with Dai Davies. The UK’s number one female bantamweight Ashley Brace produced a devastating win in her last fight at the Newport Centre and has her eye on the top European boxers, another win should bring her closer to a title fight in the next 12 months. In an exciting local clash Welsh light heavyweights Jermaine Asare and Anthony Trow will fight each other as both men look to win on home soil. Super lightweight undefeated double Kyle Jones and Richie Canning also continue their good starts to the pro ranks. Cardiff’s JJ Evans fights at home for the first time following a successful debut in Weston Super Mare on May 14th. We have four debutants on the show, southpaw and former army boxer Kristian Touze and successful Welsh amateur Sonny Lee will hope bring great Swansea support plus Heavyweight Jonathan O’Kelly from Barry and Welsh amateur champion TreHarris’ Gavin Gwynne complete the line up.